Asus Zenpad C 7.0 review | What Hi-Fi? Just a few years ago, Asus was behind one of the best-selling tablets on the market, not that you probably would have known it. It was responsible for the Google Nexus 7, a superb small tablet that didn’t cost the earth, beating the iPad mini to the shelves and also to our Award, three years in a row. The Asus Zenpad C 7.0 looks remarkably similar to its Nexus-labelled brethren, and is the entry-level tablet in Asus’ flagship Zenpad line up. It now feels strangely small next to its 8in competition and arguably a touch too small for purpose by comparison, especially with smartphones snapping at its 7in heels. It’s perfectly well formed and looks pretty good for an £80 tablet, with silver edging to the screen’s black bezel and a textured plastic finish on the back panel. This works well with the subtle curve to the Zenpad C 7.0’s edges making it easy and comfortable to hold. The cameras on the Asus Zenpad promise 2MP and 5MP front and back respectively, and while tablets aren’t exactly the most natural form for taking photos, the Zenpad’s smaller dimensions make a little more sense. Neither camera is great for point and shoot shots. Even in good daylight, the main camera struggles to pick out any detail in highlights, bleaching out clouds and the like, even with the HDR mode switched on. Outlines are hazy, particularly those at a distance, and colours lack vibrancy in a similar way to the Zenpad’s video performance. Shots indoors are subject to a fair bit of noise too, and as for low light shots, they are, frankly, next to useless. As for the selfie cam, it’s very soft, almost blurry in its results and struggles to focus, even with its smoothing “beautification” mode turned off. Its 7in screen falls short of even 720p HD at 1024 x 600, but with 170ppi and a display that sits a lot closer to the glass, it proves itself a nicer, sharper display than that found on the higher resolution Archos 80b Helium. It’s still not crisp enough for our liking, with icons looking fuzzy around the edges and the accompanying text throughout the interface looking pixellated. But open up a webpage and text is displayed much better, and though it could be sharper and bolder, it is readable. The lower resolution is more evident in video. The detail that you can pick up on better tablets is smoothed over, meaning textures lack depth and definition, landscapes can look a little flat and outlines can appear smudged. The colour palette sits on the slightly cooler side of neutral too and doesn’t have the punch in it to give blues, greens and reds the vibrancy that you’ll see on the Amazon Fire HD 8, leaving it looking a little washed out in comparison. The screen could also do with going brighter – we found we had to have the screen at maximum brightness most of the time, particularly when out of the house. It’s worth noting that the Zenpad C 7.0 can get a touch warm in use, particularly when gaming, even for a short amount of time. After a five-minute play through of Temple Run, there is significant warmth from its back panel – not hot enough to do any damage, but it will affect the battery life significantly when in this state. Even when it’s not warm, the battery isn’t a great performer. After just 30 minutes of Netflix streaming (at maximum brightness), the battery drains by 17 per cent, which is pretty substantial. There are some battery saving modes you can employ if you wish, and dipping the brightness down will help if you’re able to, but don’t expect this to last for much more than a few hours of constant use if you’re a film and gaming nut. Elsewhere, performance on the Zenpad isn’t anything to write home about either, but it’s a little snappier than the Archos 80b Helium. While flicking around the menus is mostly smooth, simple things like switching apps and moving from landscape to portrait takes a second or so longer than we’d like, and even fairly simple gaming suffers from lag and dropped frames. With a quadcore processor and just 1GB RAM, it’s hard to expect much more, but that doesn’t make it any less frustrating. Asus has included quite a lot of bloatware on the Zenpad C 7.0 too, which you can disable but not uninstall. This means that you’re actually looking at more like 9GB of onboard storage from the advertised 16GB, though you can boost this via the microSD card slot hidden under a flap on the bottom right hand corner. When it comes to music, the Zenpad puts in a surprisingly bold and upfront performance, with a mid-forward balance that puts vocals in the spotlight. We’re not sure if it’s this balance that creates an aural illusion, but it certainly makes the Asus sound louder than its competition, and lends it an enthusiastic character that works well with pop and rock music. It’s not the last word in timing or organisation though, and dynamically it could be better, so classical music shows up its weaknesses. It’s a little unrelenting too, so it’s not the most relaxing of listens. 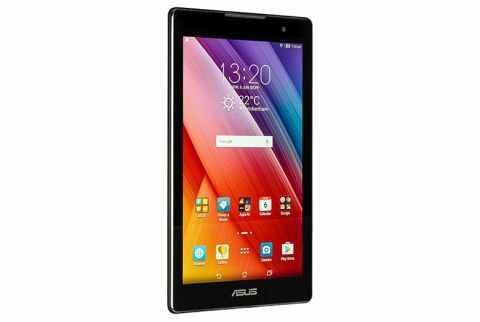 If you find the 7in screen size works for you, the Asus Zenpad C 7.0 is an affordable tablet that gives you full access to Google Play, which some rivals don’t offer. It’s not without its quirks though, and even at £80 we still want an HD screen, considerably better battery life and a snappier performance to score any higher than mid-table. Not quite the second coming of the Nexus 7 we’d hoped for, then.